Bald cypress (Taxodium distichum) trees flourish in the wetlands of the Southeastern region of the country, particularly Florida. 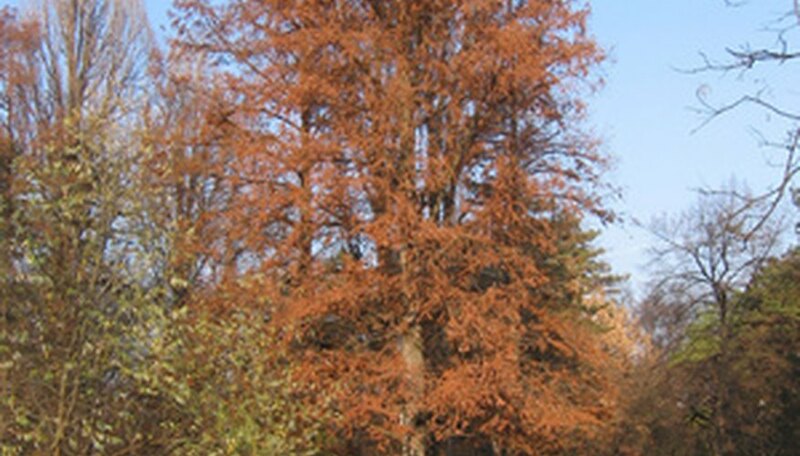 This deciduous conifer produces “knees” around the base of the tree when grown in wet areas, but the bald cypress will also grow in dry areas (without the knees). Planting bald cypress requires planning, since this tree can reach heights ranging from 60 to well over 100 feet with spreads up to 60 feet, and live for hundreds of years. Bald cypresses grow best in USDA hardiness zones 4 through 10. Designate a planting site large enough for the fully grown bald cypress tree. Use areas providing full sun and moist, acidic soil. Clear the planting region of all vegetation and debris. Dig a planting hole for the bald cypress that is double the width of the root ball (or container) and the same depth. Inspect the root system of the bald cypress before placing it in the hole. Cut off any weak or damaged roots, and loosen any twisted roots. Place the tree in the hole. Fill the hole part way with the soil your removed and then soak with water. Finish filling the hole with soil and then saturate with water again. This removes any pockets of air and settles the soil around the bald cypress’s root ball. Make a watering ring 4 inches tall encircling the tree’s planting hole, if planting in dry areas. Cover this area with 3 or more inches of mulch. Fill the ring with water any time the top few inches of soil is dry for the first season.